The annual conference, hosted by Webster Geneva's Department of International Relations and the student-led Webster Humanitarian Association, was organized in cooperation with the United Nations High Commissioner for Refugees (UNHCR) and the International Committee of the Red Cross (ICRC), and benefited from the High Patronage of the Government of the Republic and Canton of Geneva. Organization for the public conference was led by Oreste Foppiani, head of Webster Geneva’s Department of International Relations. Webster University student volunteers—notably those affiliated with the WHA—played a key role in the preparation and execution of the conference. As on previous occasions, it was held at the CICG (Centre International de Conférences Genève) in the United Nations district of Geneva. One keynote address, “The human cost of conflict: The search for dignity and rights of Palestine refugees," by Pierre Krähenbühl, Commissioner-General of the United Nations Relief and Works Agency for Palestine Refugees in the Near East (UNRWA), was particularly timely, given the recent spotlight on the Israeli-Palestinian conflict and the Trump administration’s decision to cut funding to UNRWA. Krähenbühl’s impassioned address was followed by an eloquent speech about the international community’s efforts in developing comprehensive refugee responses, delivered by Ambassador Antje Leendertse of the Federal Republic of Germany, who also gave a German perspective, as her country currently hosts the largest number of refugees in Europe. the education of children in emergency situations. Each year a team of Webster students (lower right) led by professor Oreste Foppiani gain valuable experience while making the annual conference a success. Various aspects of the global compact for refugees and refugee issues were addressed by senior UNHCR officials, including Ellen Hansen and Rita Shroff, while Erica Usher from the International Organization for Migration (IOM) spoke about the next steps towards achieving a global compact for migration. Aya Abdullah, a former Iraqi refugee and UNHCR youth delegate who is now a student at Webster University Geneva, delivered a moving speech about what it is to be a refugee, about the need for acceptance, and her desire—common among refugees—to work and to contribute to society through community engagement. A former Webster student and current visiting research fellow at Webster Geneva, Roman Chestnov, also spoke about a very pertinent issue – the use of social media and its implications for the security of refugees. On the second day of the conference, Ambassador Idriss Jazairy, Executive Director of the Geneva Center for Human Rights Advancement and Global Dialogue delivered a passionate keynote address about the need to assist and to accept refugees and migrants. During the panel sessions, Sophie Durieux-Paillard of the University Hospital of Geneva (HUG) gave a comprehensive presentation on health issues concerning migrants, while Professor Adbeljalil Akkari of the University of Geneva and Pilar Aguilar formerly with the United Nations Children’s Fund (UNICEF) shed light on the challenges of providing education to children in emergency situations. Throughout the two-day conference, there were many illuminating presentations, among them, those given by Captain Andrea Tassara on the role of the Italian Coast Guard, Pierre Gentile of the ICRC on missing migrants, and Matteo Pedrazzini on the activities of the Geneva Red Cross in assisting refugees, and Anna Maria Pirajno on the work of the Italian Red Cross Volunteer Nurses Corps. 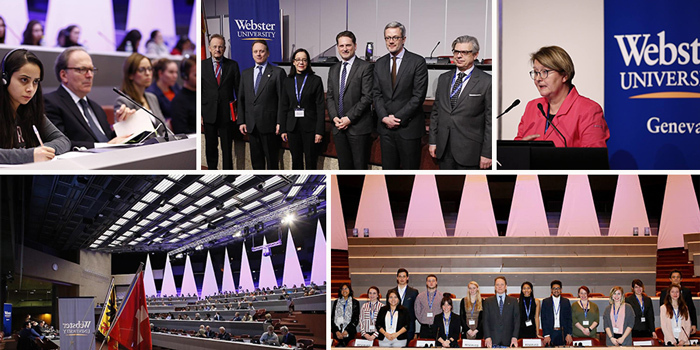 Overall, the 23rd International Humanitarian and Security Conference was a resounding success, and Webster University Geneva expressed gratitude to the many partners, sponsors and students for their support and participation. The 24th edition of the conference will be held in early March 2019, again at the CICG venue. Read the full story at Webster Geneva. 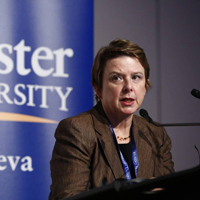 More photographs can be seen on the Webster University Geneva Facebook Page. Learn more about Webster's Geneva campus here, and about international relations degree programs available throughout the Webster University campus network and online.